The course aims to provide students with an understanding of the managerial, decision-making and leadership aspects of the hospitality industry. In addition it is also designed to develop independent research and study skills required when working at senior managerial level in the industry. The programme comprises 7 mandatory units and leads to a total of 120 credits. Minimum Guided Learning Hours are 480. Assessment is via a combination of closed book written 3 hour examination or assignment/work assessment. 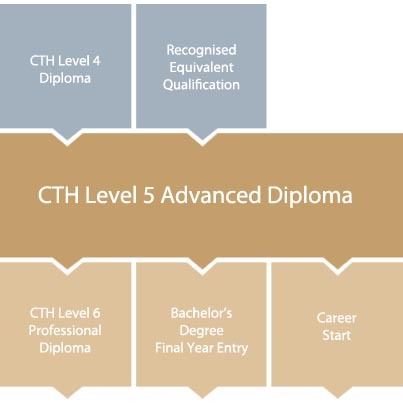 All assessments are marked or moderated by CTH. This unit covers developing food and beverage operations, understanding the management of food and beverage operations and evaluating their effectiveness. “I would recommend this course [CTH Management Programmes] to any individual who is willing to get themselves out there. It is not too late to get back into education. I thought life had nothing to give me as I did really badly in school due to my learning difficulties. But today I’m in the process of completing all my levels under hotel management in order to have a degree. This says it all and it is not too late to try”.